The aroma of freshly brewed local ground coffee beans roasted or dry is indeed one of the little pleasures of life, and once again coffee connoisseurs, coffee enthusiasts, small coffee holder groups and stakeholders in the country can enjoy this simple pleasure when they will converge in Lae at the Sir Ignatius Kilage Stadium for the third edition of the National Coffee Cupping Competition from the 16th to the 17th of August 2016. 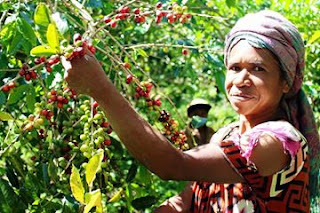 Lae city Residents can now enjoy this unique competition which aims to promote coffee excellence and market opportunities for coffee growers and farming communities while increasing PNG’s coffee trade into specialty and certified markets and with this year's event expected to be bigger and better as an increased interest is seen among farmers in Morobe. According to PNG Coffee Industry Co-operation (CIC) National Farmer Training Extension Co-ordinator Simon Gesip, preparations are well underway with CIC extension officers having just finished the first round of regional competition. “A total of 45 groups took part in the first round of competitions which saw 9 groups rejected and the CIC team is getting ready to host the 2nd regional tournament in Aiyura this weekend and the task at hand is to continue trimming down and getting the best group and coffee products to the final National Coffee Cupping Competition in Lae,” said Mr. Gesip. Coffee after Oil Palm is the country’s second largest export employing approximately over 2.5 million people and through the CIC act 1991 the Coffee Industry Cooperation (CIC) Ltd was established largely to take over the statutory and by hosting the competition since 2014 this initiative has been attracting a lot of interest from small time coffee farmers and the general public, Stakeholders with over 150 farmer groups having participated and receiving more than K400, 000 in export receipts from coffee sales is a testament through the hard work of PNG CIC that the nation’s Coffee is among the finest, richest blends in the world today that is invitingly fragrant with all the characteristics that we enjoy in that one cup of coffee that is indeed a guilty pleasure.